It’s always a thrill for us here at Bay Tours when we encounter former Hawke’s Bay residents on our travels around the country and even further afield. Sometimes it’s astonishing how few degrees of separation there are with us New Zealanders. Admittedly, there aren’t that many of us in comparison to many other countries. But it seems whenever we venture out of ‘God’s Own Country’ we continue to run into friends or friends-of-friends that we haven’t seen in years back home. Perhaps there’s actually 8 million of us in total, but only the official 4.6 million on the premises at any one time. Maybe it’s been a cunning ongoing plan by New Zealand governments over the years to encourage half the population to be out of the country at any given time in order to save on wear and tear. It brings to mind the claim a few years back by the famous London auctioneers, Christies, that there’d been more bottles sold that year of the legendary 1945 vintage of famous wine producer Chateau Mouton Rothschild than was ever actually made. Maybe, like the wine, some disreputable types are fraudulently creating fake Kiwi people and trying to pass them off around the world as the real thing!! A week or two ago we encountered a real taste of Hawke’s Bay lurking in a corner of a South Island town. We had the great pleasure of taking 40 odd Hawke’s Bay locals south to Christchurch for a couple of days before boarding the wonderful TranzAlpine train and chugging across Arthur’s Pass to Greymouth on the West Coast. 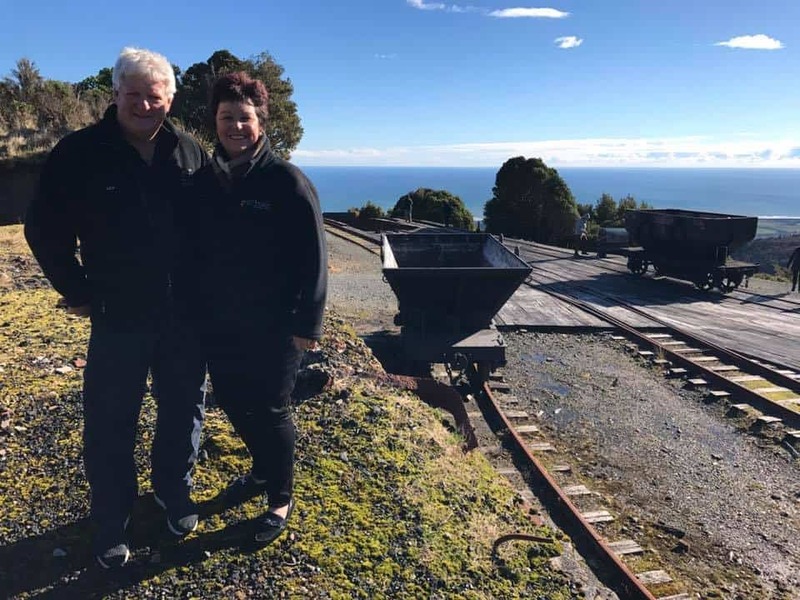 Following a cloudless day spent exploring the historic Westport and Denniston districts (See Bay Tours owners, Kerren & Ken, right, at the top of the famous Denniston Incline), we returned to the hotel in Greymouth and a few of us went off for a walk around town before dinner. We were wandering past a dusty little liquor store on the edge of town and there, on a corner shelf we spied a group of Hawke’s Bay wines living in exile. 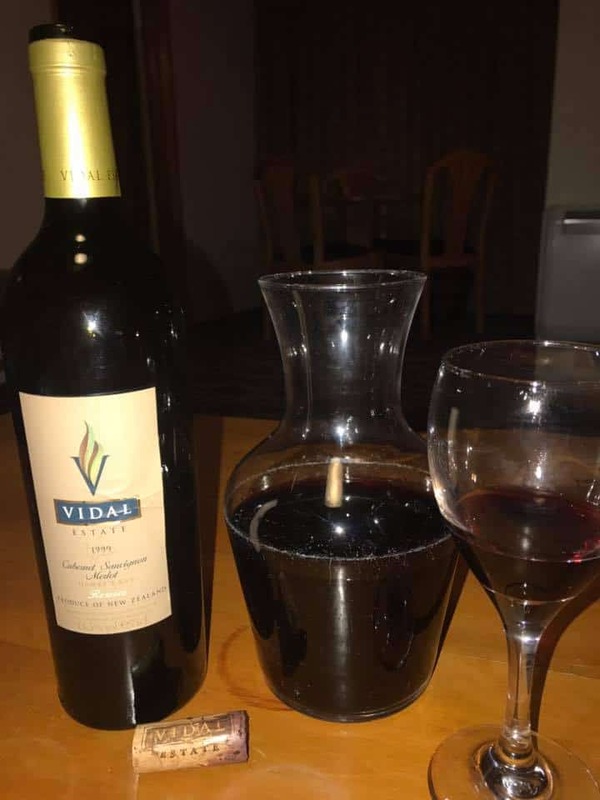 We could barely believe our eyes when we saw three bottles of 1999 Vidal Reserve Cabernet / Merlot, a wine not seen for sale in Hawke’s Bay for 15 years. Excited, we decided this had to be sampled. The portents weren’t good however. The wine was under cork and had, according to the shop assistant, been standing upright in that spot on the shelf for at least the seven years they’d worked there. What could possibly go wrong? So once the assistant had chucked in a corkscrew gratis, we ventured back to the hotel and, after dinner, borrowed a carafe from the Bar and retreated to our room to gingerly attempt the extraction of the cork……. To our surprise and delight the cork eased out in one piece (as you can see in the photo left) and looked in great nick for its age. There were no dodgy smells emanating from the bottle so we poured it carefully into the clean carafe trying to let the shoulder of the bottle catch the sediment. The colour of the wine in the carafe looked good for its age. Not the dense purple of a quality young cabernet but hey, this is an 18 year old wine, right? Into the glasses and the colour looked a little paler, again. A burgundy red in the centre changing to a brick red around the edges. The nose was a combination of those aged cabernet aromas like leather and cigar box with a port-like character as well. In the mouth the initial flavours were raisins and chocolate with a definite heat element from the alcohol. However, this subsided and the finish was still long and pretty well balanced considering the age. The wine was clearly past its very best but still drinking really well and a perfect after dinner treat. What a thrill to enjoy a distinguished aged Hawke’s Bay cabernet dominant wine. A rarity these days and a real treasure! So there it was. A cracking good, fully mature Hawke’s Bay wine simply sitting and waiting for us on the South Island’s West Coast. And remember, there’s still two more bottles back on that shelf.